I'm having an issue with my 800. It seems to power on but it displays a black screen, whether a game cartridge is in the machine or not. Any ideas? Also, what are the power supply specs for the 800? Isopropyl Alcohol to clean the cards? I use de-oxit but... in a static free environment any zero residue contact cleaner should be fine... so long as that isopropyl is clear and not rubbing alcohol your should be fine. Edited by _The Doctor__, Sat May 20, 2017 3:43 PM. My other 800 works on my tv just fine. 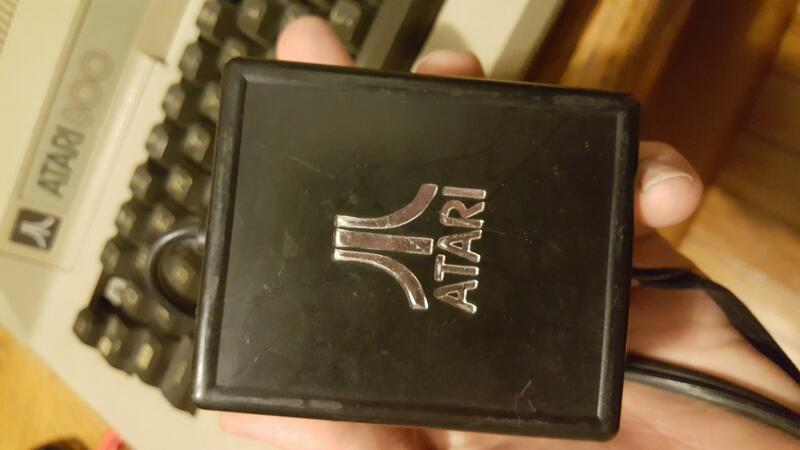 Bought another in a big lot of 800 stuff (40 cartridge games, 810 disk drive, 410 recorder and an atari printer) but all I get is the black screen. I think I'm going to try to clean to 10k rom OS card first. Isopropyl works great - 95% of the 2600 carts I buy will work great with a good cleaning or two. The handful of exceptions will almost always work with a squirt of CRC or Deoxit. If the machine just doesn't boot up, simply take off the case cover and remove/reseat the boards. 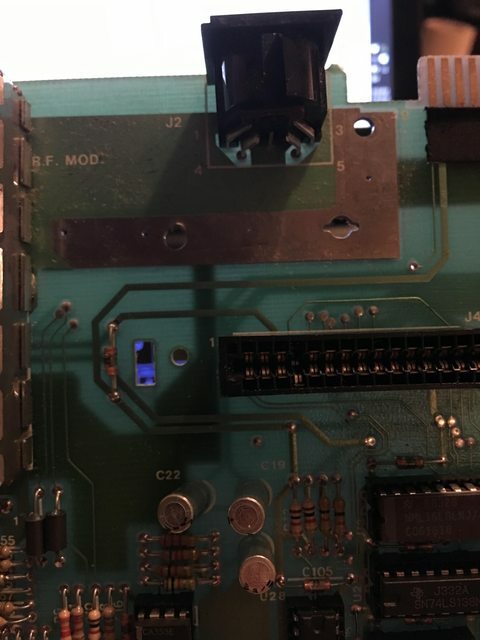 If that doesn't work, open it up all the way to access the "personality board" that has 6502, GTIA and ANTIC and reseat them in their sockets, and reseat the POKEY and PIA on the mainboard. You'll have to open up the RF shield though. Fourth pin from the left on the top row is bent out and contacting the pin across from it on the bottom row (and pushing it down). I brought home an 800XL with some carts and began troubleshooting my original 800 using the carts. I went back and forth a few times with the 800XL and after the second insertion of Pitfall II, the XL would only give a black screen. I don't know how it got mangled so quickly with so few insertions. I was not harsh. I desoldered the whole connector and ejected the pin out of the bottom. I ejected another for comparison and tweaked it back into shape. The pin on the bottom row that was being pushed by the mangled pin sprung back into place on its own. I switched the straightened pin's position with another pin that looked like it had no connection (even though the pinout lists a purpose for every pin) and soldered it all back down. It has worked well ever since. Edited by CZroe, Sat May 20, 2017 6:51 PM. Also, what are the power supply specs for the 800? isopropyl alcohol you can buy some small sterile prep pads from the drug store. They are 70% alcohol and 30% water, but make sure you dry the boards good. the CPU off before applying heat transfer compound. 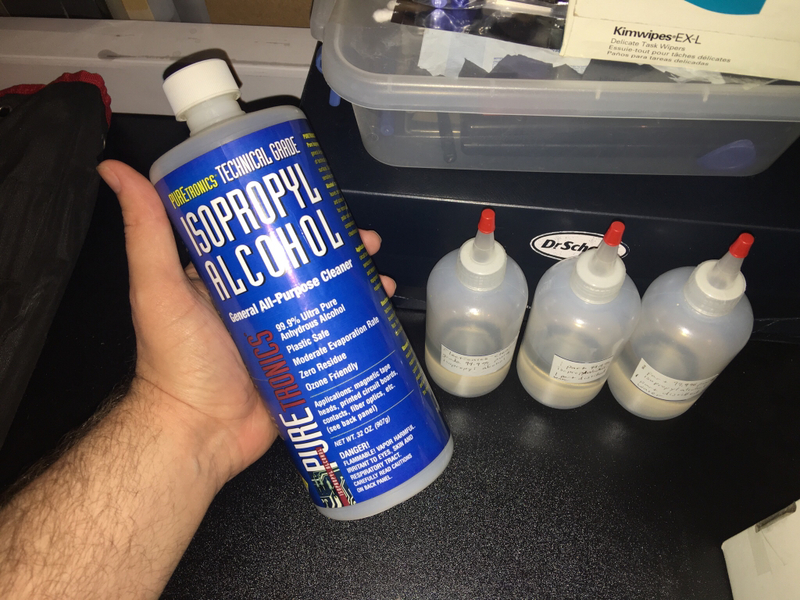 Fry's is where I got my 99.9% "Electronics Cleaning Grade" Isopropyl alcohol... PUREtronics brand. They also had MGChemical brand but it was a lot more per ounce. I can't find a giant bottle of the stuff at the same location anymore but they always have the MGChem brand. 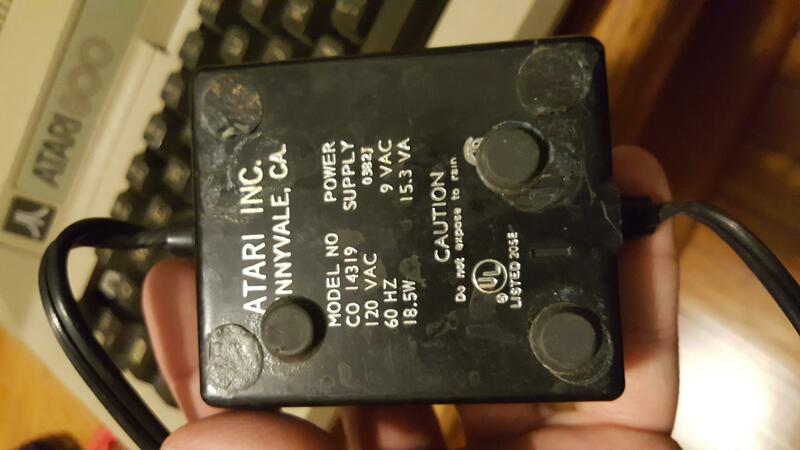 Then what is this power supply for? The 810 disk drive? That will work on the 800 too. The 800 will stress it a bit (cause it to run a little hotter), and make it more likely to blow the internal fuse. A black screen on an 800 usually means bad ROM. Try the other 10K ROM board from your other 800. If that cures it, you probably have a bad ROM chip on your 10K OS board. That's a good price! Is that French on the bottle? I bought a big Pyrex Lasagna dish (16" x 10" x 2" deep) to soak the boards in after I do rework on them. stuff! One word of caution... Don't pore it down the drain when it get dirty. KABOOM! Cleaned all the connectors. Took the machine apart, cleaned everything and still has a black screen. Yeah, but this stuff was $10 less for 22.5% more! That's why I'll look for it first the next time I'm at Fry's Electronics. I was going by the pictures where PUREtronics says 904g and MGChem says 740g. Strange. Yeah, $7.99 for this stuff was a surprisingly good deal and I wish I stocked up. I've run into the same problem with my 800, rapoza609... Have you had any joy since? I'm going to reseat all my RAM/the ROM tomorrow and see where we go - I noticed on my power socket some corrosion so have tried some electrical contact spray in that area but so far... no go. Prior to stripping down the 800, btw, it was working intermittently - I'd get the blue memo pad screen but because of that dodgy power connection - the screen would suddenly go haywire and random graphics/loss of picture display would soon follow after being powered up for anything more than say 20secs. Well, speaking for myself and my 13 A8 computers, plus 1 5200, the only capacitor I've ever had fail was a tiny little 10 uF capacitor in the video circuit of an 800XL, right near the 4050 hex buffer chip. The machine still worked but I had no luma signal (so I got black instead of white text at the READY prompt, for example). And that cap had split and leaked a bit onto the board - it was very obvious to see it had failed. So unless you disassemble the machine and see something swollen and leaking, it's unlikely to be a bad cap. So first thing I'd do is take off the cover and pull the RAM and ROM boards. Reseat all the chips and see if any of the sockets appear to have broken wipes (the metal contacts that touch the chip legs and extend down to be soldered to the PCBs. After reseating the chips, reinstall the boards and see if it boots. If it does, and the power connection is still dodgy after cleaning, the jack may need to be re-soldered to the power supply board. That requires disassembling the machine of course. 800's are rather complicated beasts inside so if you haven't done it before, take your time. Take pics to see how it all goes back together, etc. I like to have the parts handy because taking something apart takes up space, which is limited, and leaving things taken apart can result in losing parts. Plus I noticed they use a lot of different screws in the 800 internally, which can be hard to keep track of when disassembled.